R.I.P. Shows : We Said Six seasons and a movie! Who doesn't miss 30 Rock and all the NBC jokes? NBC is probably the most trigger happy network ever and this year was no exception. Let’s be honest, Bad Robot shows are not the same as when JJ Abrams was actually producing/writing them, but still… Revolution was never what I expected, but I am still relatively sad to see it go. Believe was just getting its footing and I thought it had potential, I think cancelling it was premature… and it aired against Game of Thrones, honestly… what did they expect? Also, I was getting into Crisis, but that cancellation didn’t surprise me at all. But nothing, NOTHING, came close to my UTTER DEVASTATION after losing Community. Yes, it had its up and downs but it was one of the few edgy/quirky comedies left on TV. Also, I loved what it represented: The little show that could, always on the verge of cancellation but hanging on due to the cult following. The dream of “Six seasons and a Movie” was never realized and that is just sad. OK, I admit. Community wasn't for everyone. I get that NBC is downsizing the comedy hour and I think Parks & Rec deserved that last season, but I am sad the only survivor was About a Boy. I kind of like that show, but Community was so much more special and I am also sad NBC didn’t keep The Michael J. Fox show around for a bit longer. Having MJF back on TV was pretty great in my book. I would be feeling like torching the NBC headquarters if it wasn’t for the fact that they had the decency to renew the BEST SHOW on their schedule. No, I don’t mean The Blacklist. I mean Hannibal! The show may not have the highest ratings, but content-wise is far superior than anything on broadcast TV right now. Parenthood also survived to live another day, which makes me happy [but I am OK with next season being the final one]. Last year, the show I was most excited about [from all networks] was The Blacklist. 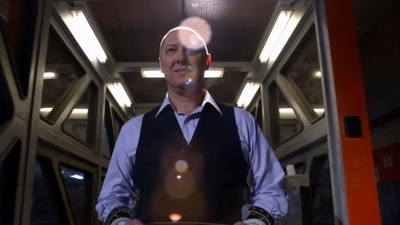 It looked amazing and it had James Spader! Is James Spader AWESOME on it? You bet he is! [Yes I like him a LOT]. Is the show awesome? Meh… it’s alright. It’s quite good… but it’s not the most incredible thing on television and I keep thinking that if it didn’t have James Spader I wouldn’t like it half as much [I would probably still watch it]. But as I said: cool premise + James Spader, there was no way they could screw that up. And obviously they didn’t because it is NBC’s biggest drama hit. 2014-15 Season: Vinnie Van Lowe or Papa Mars? Apparently NBC decided to get rid of their sitcoms and embrace a romantic comedy theme? New show A to Z, is basically the chronicle of a relationship [“from A to Z”]. It looks cute, but there is a reason romantic comedies are made into movies all the time and not TV shows… after a while it is bound to get annoying. Boring if they get together and annoying if they keep up the will they/won’t they for too long. I could be wrong. I will watch A to Z. On the other hand I thought MARRY ME looked awful, despite me liking both actors [separately but not together]. And if I am going to watch a Veronica Mars former cast member I think I’ll go with Enrico Colantoni on The Mysteries of Laura. Starring Debra Messing, Josh Lucas and Laz Alonso [good cast Check]. The show is about a tough detective who fights murderous criminals but can’t handle her kids. It’s a mixture of famly comedy and gritty crime drama. Sort of Prime Suspect meets Parenthood. It sounds COMPLETELY RIDICULOUS! So why am I excited about this? 1) It has a great cast 2) The trailer made me laugh 3) It’s a Greg Berlanti show and I love Greg Berlanti shows. I thought Eli Stone sounded RIDICULOUS too [a lawyer who hallucinates musicals? Come on!] and I LOVED Eli Stone. So I am willing to trust that Berlanti can make a ridiculous premise good. But it’s a leap of faith. About the rest of the shows… Not much hope for Bad Judge [I have casting issues with it]. Constantine is definitely not my cup of tea [despite all the Lost actors], but it does look good for people who enjoy the supernatural genre. State of Affairs looks like it could be good… [Scandal meets Homeland? ], but for some reason it doesn’t excite me. I don’t think Katherine Heigl was the right person to cast and the tag line “All the President’s men are nothing compared to her” was the cheesiest thing I’ve ever heard!